Featuring 2 bedrooms, 2 bathrooms, and enough sleeping arrangements for up to 6 guests, this unit is a terrific size for a couple or small family looking to experience the best of Punta Cana. You and your travel companions will have plenty of room to spread out and relax throughout the condo’s 1300 square feet of beautifully decorated living space, which has been recently updated with new hardwood floors, new tiles in the bathroom and kitchen, new paint, and new furniture. Get a good night’s sleep on either the brand new queen-sized bed in either of the bedrooms or the sofa bed in the living room. When you’re not out enjoying one of the area’s many excellent local restaurants, prepare a delicious home-cooked meal in the condo’s fully equipped kitchen, complete with all the necessary modern appliances. Free wireless internet and cable TV are provided to keep you entertained during your downtime. The condominium complex also offers several great amenities available for guest use, such as an outdoor swimming pool, lounge chairs, and a BBQ. After a fun day of sightseeing or shopping, look forward to unwinding by the community swimming pool before getting ready for a night out on the town! 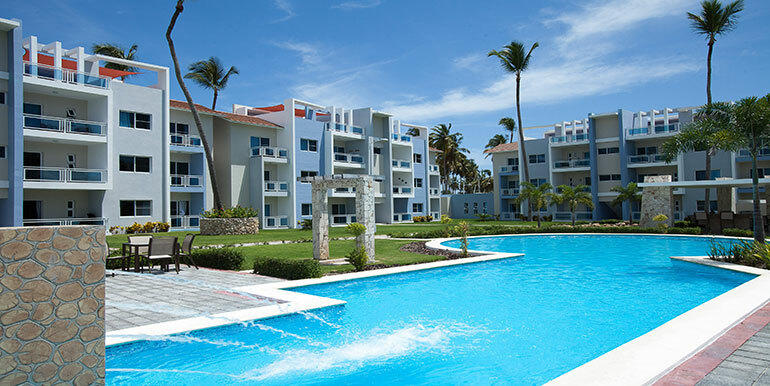 From this fantastic condo, you’ll get to enjoy easy access to practically everything Punta Cana has to offer! The famed Bavaro Beach can be reached my walking in a matter of minutes, where you’ll encounter dazzling lights, fabulous shows, clubs, and of course, casinos. You’ll find numerous good restaurants nearby, as well as places to exchange your money, groceries, shopping malls, and pharmacies.. Whether you’re visiting the area on business to attend a conference or for pleasure to go clubbing and see as many shows as possible, this outstanding Punta Cana vacation rental condo will not disappoint! My pleasure Hannah. Hope to see you again soon! The place was in a great location! Short walk to the beach and surrounded by great people! Highly recommended and Dhai was very helpful and quick to respond if you need anything during your stay! Nice Apartment, safe with security 24/7. Good for kids and families. Great location and very nice owner. Thanks for your comment! I hope to meet you and the family soon! Very quick walk to the beach, close to restaurants and shops. The place looks just like the pictures, there is security 24/7 and the pool is great. We will definitely come back! Dahiana is a wonderful host who makes sure that her guests have everything they need. She has been very helpful and provided all we need. The place is the same as described. Looks better then on the pictures. The apartment has security, so you are safe on your territory. 5 minutes walking to the beach. Really enjoyed the stay. Your family was amazing! I enjoyed the time I host them! I hope to see you soon! Diese Wohnung hat alles was man für einen gelungenen Urlaub braucht. Genug Platz für 4 Personen, gut ausgestattete Küche, Wasserspender, Waschmaschine + Trockner, großer guter Kühlschrank, zwei funktionierende TVs. Wer möchte (ich persönlich habe immer ein Auto in der DomRep) kommt hier auch zu Fuß zurecht (Strand, Restaurants, div. Geschäfte in Reichweite). Der Pool im Innenhof bietet genug Platz für Sonnenanbeter und Wasserratten. Die Gastgeberin ist sehr aktiv, kommunikativ und hilfsbereit. Danke!! It was a pleasure to host you and your wife! Excellent stay. Kitchen is stocked with plenty of dishes, glasses etc. laundry in unit is very convenient and works well. I suggest you go to los pinos gift shop around the corner and see the adorable kitten and puppy there!!! The beach is a super quick walk with food places bars shops etc all along the way. Perfect island experience. Thanks Katii, it was a please hosting you! You're welcome anytime and I hope to see you again soon. Super! Great location, beautiful apartment, very nice and helpful host. Really recommend! It was a pleasure to host you! Gracias Kristel. Fue para mi un placer recibirlas! Gracias por su visita! The place was amazing and let me not leave out the part that Dahi was even more great! Very clean, very cute apartment. Walking distance from great restaurants like Onno and Capitain Cook and the beautiful beach. Dahi made our stay very easy and was very accommodating by helping us with any questions we had and providing lots of recommendations. Looking forward to visiting the Dominican soon and booking with Dahi many times in the future!! Ahhh Leslie, Thanks so much, means a lot to me you had a fantastic time in DR ! Dahiana was an exceptional host and made me feel as though I was home. The apartment was extremely clean and well maintained. 24/7 security. When I return, Dahiana will be the first person I contact. Thank you Dahiana the apartment exceeded my expectations !!!! What a an honor to meet you! Gracias Aj! The place was very nice clean & spacious, with everything that we needed. Close to the beach and many good restaurants. My friends and i enjoyed our stayed and would like to comeback as soon as possible. Thanks so much for sharing! you are welcome anytime! We enjoyed our week long stay at Dahiana's. The unit was tidy however a bit more attention could have been paid to cleanliness prior to our arrival. That said, Dahiana was prompt to rectify this. The location is excellent with the beach nearby as well as restaurants and a grocery store within walking distance. BAM market delivers so you don't have to carry everything back in the hot sun. We made good use of the beautiful pool and BBQ within the complex. Dahiana was not present at check in and there was some confusion regarding the electricity meter that could have been avoided had she been able to greet us in person. A manual explaining where the garbage disposal etc is located would have been useful as well as black out curtains in the living room. The pictures are a true representation of what the unit looks like which is spacious and nicely decorated. 24 hour complex security and friendly residents/guests. Dahiana was responsive to our questions and very friendly. Overall, we would return! Place was great. Central to everything, easy access to get around. Dahi, was an exceptional host and very easy to reach, if ever needed. I wish to host you again soon! Thanks so much, Ori ! Don't hesitate.... this is the best, well located, brand new, spacious and more. But the best asset is Dahiana, she makes you feel like home.... best experience ever!!! Thank you!!! Gracias Leslie! :) :) it will be an honor to host again! My friend and I spent 11 days and nights here and it was perfect. The living space is huge and on the ground floor. The complex was quiet and relaxing. The pool is perfect and there's lots of room to lay out. There's a great BBQ area by the pool. The place felt secure and in a great location and so close to restaurants and the beach. Dahiana was the perfect host, too. She checked in with us often. She gave great recommendations for any activities that we wanted to do. Dahiana was amazing!! I willl definitely book with her again. Thank you, Dahiana. We had an awesome holiday. Miss you already!! it was a pleasure to host you! Thanks so much for your comment, means everything to me! Dahi is an excellent host! She gave us great recommendations and was helpful and very responsive to all of our questions during our stay. The place was great too. It is a very new building, awesome pool, guarded 24/7 by security, and had all of the amenities we needed. Very clean, AC worked well, and enough space to accommodate 5 people max. 2 per bed (2 beds) and a pull out sofa. If you're a larger person, you might only be able to fit one per bed but we were able to make 2 to a bed work just fine. Great location if you're looking for the local flavor. Easy access to the beach and local spots. I would HIGHLY recommend. Just remember that electricity is settled at check out. We did a good job using AC only when we needed, and the cost was very reasonable for 5 days split among 5 people. Your kind words means a lot to me. You were a wonderful guest! Hope to meet you and your friends in the near future! :) :) :) Gracias Paul! Great overall experience with Dahiana and this property. The apartment looks just like the pictures, very clean and incredibly well located (steps to the beach,bars and any necessary transportation to get anywhere in Punta Cana). Dahiana was there to meet me when I arrived and followed up multiple times in case I had any issues or questions regarding the apartment (I had none). Highly recommend if you're looking for a vacation spot in the area to check this one out and to work with Dahiana. Thanks so much for sharing your comments! It was a pleasure to host you! Dahi was a great hostess. Her and her husband provided invaluable information about places to go and local necesities. She promptly answered all questions I had. The apartment is just as described and conveniently located near shops, restaurants and the beach. I felt completely safe (24 hour security). There was a seperate charge for electricity but it was totally reasonable. Thank you so much. I had a very relaxing time. I plan on coming back very soon! :) Highly recommended!! It was a pleasure to host you! Thanks so much for your review. Dahi was very warm and welcoming! She picked us up from the bus stop to make sure that we got to the apartment and to show us around. She was also very quick to respond to our questions. Just note that it is a bit farther from the beach than it appears on the map, and it takes about 5 minutes to get to the beach by walking. There are lots of great local restaurants to eat at within walking distance, and we definitely enjoyed our stay! Thanks so much for sharing your review! I hope to see you again in Punta Cana. We came out for family vacation.the location property was secure ,safe&VERY CLEAN. Gracias Brandon! It was a pleasure to host you. Dahiana was a great host! She was very accommodating and gave me all the required information about transportation well before the date of my arrival. She was excellent on following up with any questions/concerns and adequately prepared for my trip. The rental is spacious, tastefully decorated, and is stocked with everything one might need for a comfortable stay – the grounds were well kept, beautiful pool, plenty of linens and dishes, etc. The location of the condo is perfect - a 5 minute walk from a variety of restaurants and a 5-10 minute walk to the beach. A fabulous way to experience the DR!